With Freerice, you can do good by having fun. 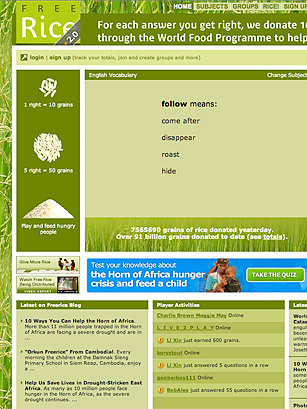 Answer one of the multiple-choice questions correctly  on topics such as English vocabulary, geography or chemistry  and the site's sponsors will donate 10 grains of rice to the U.N. World Food Programme. It doesn't sound like a major act of charity  but so many people answer so many questions that the site is responsible for the donation of hundreds of millions of grains of rice every month. That's enough to make a major difference for tens of thousands of hungry people in Haiti and other countries that need help.